With Current Affairs now being a substantial part of almost all major entrance examinations, it becomes highly imperative for any student giving such exams to have basic knowledge of all the important current events. However, with abundance of current information available online as well as in various books and magazines, it is a tiresome task to separate the wheat from the chaff and extract the useful and valuable information from such books. Furthermore, with overabundance of theory material available widely, what was required was a practice book on current affairs to put your knowledge to test. This book seeks to fill that void. 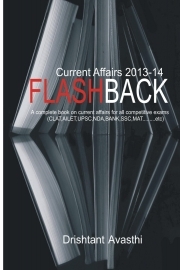 Flashback features over highly relevant time line and questions covering all the important news of the past one year (specifically Jan,2013 to Dec, 2013) neatly complied and segregated into 9 chapters. Each of these questions signifies the importance of the underlying topic, and seeks to test the student on the most important part of the subject. and Information Technology. He is the founder of Spandhan Group. also won quiz competitions organized locally and nationally.